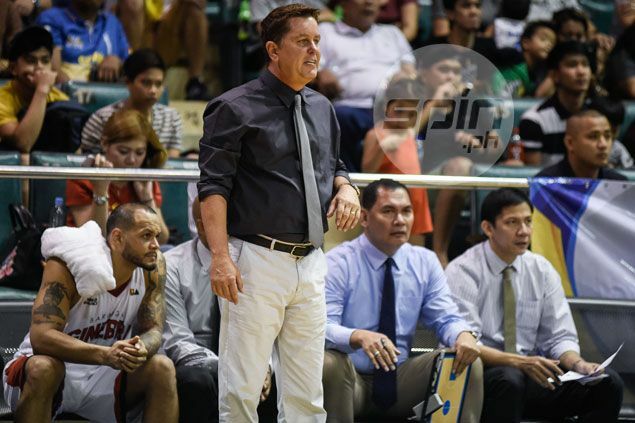 TIM Cone was happy enough Barangay Ginebra made it to the quarterfinals of the PBA Philippine Cup. He was even doubly happier when informed that as per playoff seedings, the Kings are safe about an early clash with two-time defending champion San Miguel Beer. As things stand now, the league’s most popular ballclub are likely to finish at no. 7 in the quarterfinal playoffs, meaning a quarterfinals match-up with the no. 2 seed in the next round of the all-Filipino conference. As owner of the best record at the end of the eliminations, the Beermen will finish as the top seed going to the playoffs against the no. 8 team. Cone welcomed the scenario with open arms. “That’s one good news,” said the Ginebra mentor after the Kings turned back the NLEX Road Warriors, 90-80, on Sunday night to finish its elimination round campaign on a high note. “At least we avoid San Miguel. We’ll rather see them later if we can. The Kings finished with a 6-5 record, good enough to make the next round, just a conference removed from their successful championship run in the last Governors Cup. Cone clarified with league chief resident statistician Fidel Mangonon III if the Kings are not about to fall at no. 8 when the playoff scenario finally clears by the end of the eliminations Wednesday. “At least we avoid playing San Miguel in the first round. There’s no chance for us to be at no. 8,” said the most accomplished coach in league history. At the most, a Ginebra-San Miguel match-up will be for the season-opening conference trophy.